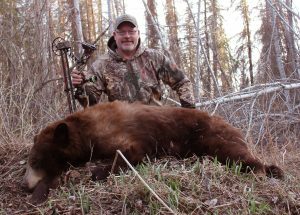 May bear hunters are interested in shooting a big mature bruin, but more and more bear hunting enthusiasts are looking to add a color phase bear to their collection. Blonde bears are characterized by yellow to a very light brown color and may have darker colored legs and head. Cinnamons are a brownish-red color showing a distinct reddish tint characteristic of the spice after which it is named. In some areas these bears are called red bears. Brown, normally called chocolate to distinguish them from Alaskan brown bears, can range from fairly light brown to a deeper, chocolate brown color. Dark chocolates are the most common color other than black. Bears with jet black fur are the most common and have the unmistakable pure black fur with often a shiny black sheen. Blacks commonly have a white blaze on their chest in some locales, while bears of other colors rarely do. There are other colors that show up in tiny geographic areas such as the Kermode Bear and the Glacier bear, but for the common man who would like to collect a bear of several colors, these four color phases—black, brown, cinnamon and blonde–represent the opportunities available to us. A growing number of people are showing an interest in shooting a bear of a color other than black and I am one of them. I am aware of a very small number of people who have harvested one of each of the four major color phases. I have taken three of the four color phases and I am up for the challenge of taking the hardest of them all, the blonde phase black bear. I arrowed the cinnamon bear on a hunt with Thunder Mountain Outfitters in Saskatchewan during the spring of 2014. I have been working on getting the blonde for three years now. I would have bagged them all, but for the commitment I have made to myself to shoot one of each with a bow. Why would anyone want to go to the trouble to shoot one bear of each color phase? Well, why do we have Pope & Young and Boone & Crockett record books? By our very nature, hunters are collectors; we like to add things to our collections and keep track of things like size, color and other characteristics. There are plenty of benchmarks to strive towards. Some people really want to get 500-pound bear, some want to get a B&C bear, some want one with a nice blaze on the chest and some want a bear of a different color. It’s a part of who we are as hunter-gatherers and collectors. And it’s an important part of why bear hunters love bear hunting. Deer hunters, for example, have little to go on by comparison. We measure antlers by the inch and in some areas deer are weighed and recorded. That’s pretty boring when compared to the benchmarks bear hunters have. Interestingly, the vast majority of black bears of a color other than black are found west of the Mississippi river. There are tiny populations of brown bears in eastern Minnesota and western Wisconsin, for example, but nothing like the numbers of color bears of the west. 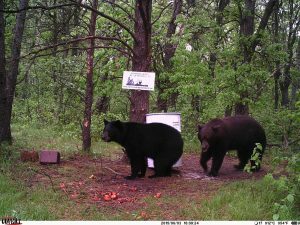 It’s estimated that about 5% of the bears in Minnesota are brown with the majority found in the northwestern corner of the state. Western Ontario contains a small number of brown colored bears as well. Farther south, Arkansas and Oklahoma produce a little higher percentage of brown bears and even the occasional cinnamon. This is in keeping with the general trends that the farther west and south you go in North America, the greater the instance of color bears and the lighter the colors. This is a mystery but maybe someday a DNA study will be done and shed some light on this puzzle, but in the meantime, most of us are happy to have the variety and the challenge these western color bears offer. Bears of differing colors often inhabit the same areas. 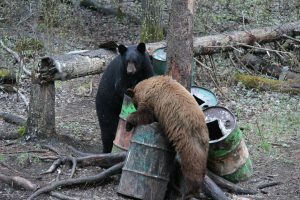 A brown and a black bear feed at the same bait site in the Duck Mountains of western Manitoba, an area well known for varying colors of black bears. So let’s take a look at the four major colors and divide them up geographically. If you are on a quest for a bear of one of these colors, this should help you narrow your search. Blacks, of course, are found across the eastern US and Canada. Rather than explain where they are common, it’s easier to explain where they are uncommon. Across the western US they run about 50 percent and in some states less. Black bears are less common in Canada in the Rocky Mountains in Alberta and British Columbia where increasing numbers of browns cinnamons and the occasional blonde may be found. States such as New Mexico, California, Colorado, Utah and Arizona have fewer blacks than other colors. In Washington and Oregon, they run about 50% with other colors. Black bears run at least 40-50% across the northern territories of Canada, and then become scarce in Alaska where once again most of the bears are black. The Northwest Territories has fewer black bears than the Yukon, showing a trend towards color that reverses itself as it gets closer to Alaska and the west coast of British Columbia. The coastal areas and islands of Canada have bear populations consisting of nearly 100% black bears except for the pockets of Kermodes and Glacier bears found in BC and Alaska. Brown bears are the second most common color phase. I mentioned western Ontario and Northwest Minnesota, which is the eastern end of the range where brown bears are common enough to mention. As you go west across Manitoba, browns become more common, with chocolate, cinnamon and blonde bears showing up in good numbers in the Duck Mountain and Riding Mountain regions of western Manitoba. Saskatchewan has good numbers of browns, especially the chocolates across the province. As you go west, browns are still common in Alberta and British Columbia, but the colors tend to be lighter, with some of the dark chocolates, but also more cases of browns a little lighter in color than what we would consider chocolate. Brown bears are common across the Rocky Mountain states of the US, particularly more common in the northern rockies such as Montana, and in the Cascade Mountains of Washington and Oregon. There are plenty of chocolates, but also browns that trend a little lighter in color. 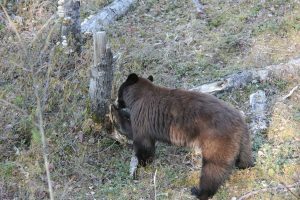 These areas also show decent numbers of bears that are lighter in color on their back and shoulders, but fade to a deep chocolate in the legs and sometimes the head. Cinnamon bears or “red” bears as they are called in some locales may be hard to distinguish from browns except for the red tint to their fur. This color is very easy to recognize in the sunlight but can look like a medium brown on overcast days while looking at them from a distance. Cinnamons are found throughout the western US and Canada but are not as common as browns. Arizona, California, Colorado, Montana and Wyoming boats the most cinnamons in the USA, and they range in good numbers from the far western part of Manitoba to the rockies in British Columbia. Cinnamons are more common in populations in the southern Rocky Mountains. Areas with savannahs and open mountain slopes tend to have more cinnamons than the higher alpine regions. The author with the cinnamon color bear he shot in Saskatchewan in 2014. This bear was his third of four colors. He has two hunts for blonde bears in 2018. Blondes are the least common of the colors. The occasional blonde will show up in Manitoba but the farther west you go, the more blondes you will have. In no area are they abundant. Because they are such a novelty, larger specimens tend to be rare no matter where you go. A blonde bear of any size is desirable to many hunters so a smaller percentage of them reach large size except in remote areas where there is little to no hunting pressure. The highest number of blondes in a population are found in the desert southwest with New Mexico and Arizona leading the way. Colorado and California are good options too. Following those options would be Idaho and Montana. Alberta is the Canadian province with the most blondes, although the areas with numbers of blondes tend to be spottier than the best parts of the States. If you would be considering a trip to any Canadian province with a blonde bear high on your priority list, make sure you ask to see recent trail camera photos if the hunt is a baited hunt. 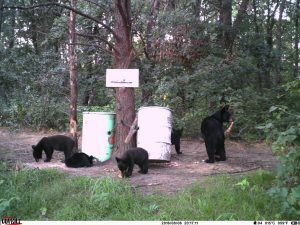 One advantage of hunting Alberta is the two-bear limit. This allows you to shoot a nice representative bear if the opportunity presents itself, then hold out for the color of your choice. I have found that many Canadian outfitters like to say they have 30% color bears. That’s a number that’s thrown out in most of the four western provinces. But without a doubt, some areas produce more browns, blondes and cinnamons than others, so you must do your homework and due diligence so you are not duped into going to a place that is less than the best for what you want in a color phase bear. Why do black bears occur in a variety of colors? I have asked this question of several biologists and all of them offer the same basic answer: We don’t really know. Some theories have been put forth, some of which seem plausible. The predominant theory has to do with the geographic range of the bears. In the western states, bears tend to spend more time in the open, feeding in clearings and on open hillsides. 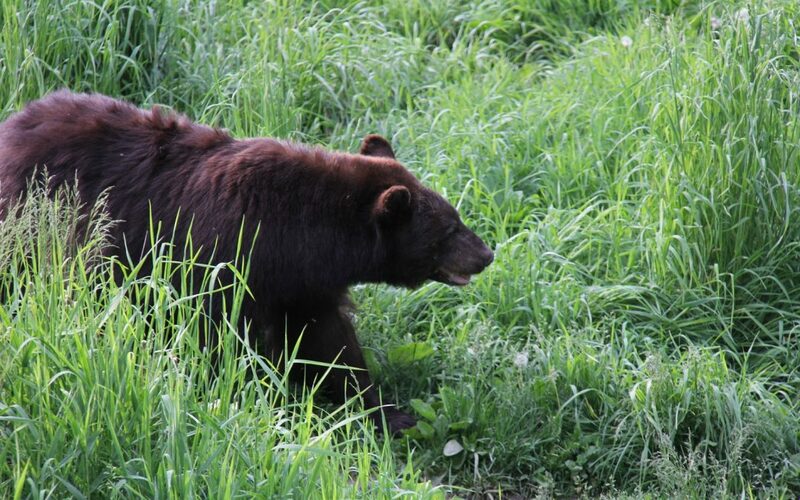 Having a black coat in the open sunshine may not only be uncomfortably warm, but might also make the bear more visible. The black coats on bears that live in thick forested areas can be an advantage. This adaption to the environment would stand to reason, and the geographic location of most color phase bears would seem to support the theory. But there are many areas where blacks and other colors are mixed in thick forested areas. Black bears and bears of other colors interbreed without hesitation. This photo was taken on the author’s property where he monitors bears. The large chocolate male has been seen with several black females during the past breeding seasons. This photo is from 2015. If these colors were actually an adaptation to their environment, it would stand to reason that the colors inferior for the particular environment would have been eliminated long, long ago. But you can go to many places and find the light yellow blondes and jet black bears living and feeding side by side. Bears of differing colors can occur in the same litter. I once saw a black bear sow with two blonde cubs. I’ve also seen a brown bear with a black cub and a cinnamon cub. I have a black sow bear on my property this year with four cubs, three of which are brown and one is black. Sows commonly breed with more than one boar. Could these cubs be from the same father or could she have bred with males of two different colors? Like the answer given by the biologists, we really do not know for sure. During the summer of 2016, this sow was a resident on the author’s property. She has four cubs, three of which are chocolate and one of which is black. Could this be the same female shown the prior year in the above photo? There’s a grand slam of turkeys and a grand slam of sheep; why not a grand slam for predator hunters. There are four species of bears in North America, black bears, polar bears, brown bears and grizzly bears. That’s one grand slam available to bear hunters, but finding a place in the budget for these hunts is out of the question for most of us. 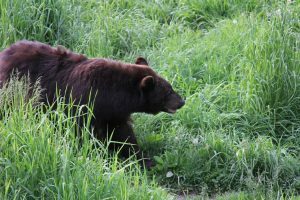 A grand slam of all four major color phases of black bears is more attainable for the average hunter. Shooting a blonde, black, cinnamon and a chocolate is a goal only a handful of hunters have reached, but it’s within reach for the working man’s budget. It’s time we bear hunters have an organization that keeps track of grand slams for bear hunters and I am compiling a list of people who are interested in being involved. If you have taken all four species or all four colors, or have an interest in doing so, contact me at berniebarringer@gmail.com. *Percentages are estimates and vary depending upon specific area. All other states and provinces not listed less than 1-percent. I liked your article about the color phase bears, I have been trying to get one myself.I have been told by a bear guy and I believe it was even published by the mndnr that bears can be in color phase one year and back to black the next or go back and forth and others will always be black.I don’t know what happens but when you target a certain color they get more difficult to hunt. Colors are genetic and cannot change. Great article Bernie so true the color phase of black bears is a huge reason I personally love to hunt bears,if your in an area with color phases of higher percent chances it’s even more exciting, but even with lower percent chances of color phase in certain areas you never know what could show up at your hunting stand,again another reason bear hunting to me is the ultimate challenge. I have hunted in the Duck Mountains many times and there are several good outfitters there including Baldy Mountain Outfitters and Canadian Wilderness Outfitters. 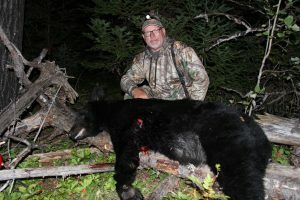 I have not hunted around Riding Mountain so I cannot recommend an outfitter there, but I do know some of them produce good numbers of color phase bears and big bears. Riverside is on lake Dauphin not in the DUck Mountains but he has a pretty good reputation is all I know. Good luck.